Super Joe goes to school…. When you walk into It’s All About Kids Preschool it appears to be just like any other preschool. You can hear the sweet sound of children’s giggles, preschoolers sitting in brightly colored classrooms listening to their favorite stories, teachers patiently working with their students preparing them for the years of school that lie ahead of them. What makes It’s All About Kids Preschool different is that it IS all about kids, whether they have special needs or not. 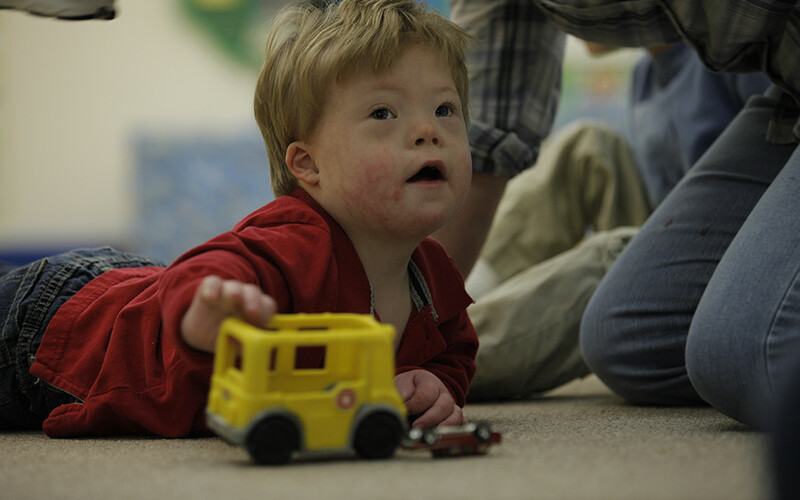 In the two-year old classroom you will find Joey, laughing and playing with his friends, and though he can’t talk or walk yet he gains new skills every day and his classmates know him as their friend. Joey, known by those who love him as “Super Joe”, has one extra chromosome, Trisomy 21 or Down syndrome. Joey defied all odds in his first two years, overcoming multiple pregnancy complications, open-heart surgery and all of the sniffles, bumps, and bruises that are common with toddlers. As “Super Joe”, preschool should be a breeze. Joey’s parents, Jen and Tom, are committed to providing typical experiences for him and his brother Tommy, such as preschool and playing with friends. Because children with special needs enter the world of the public school system at age three, Joey’s parents wanted to expose him to a classroom experience at age two to prepare him for this transition. It took more than one try to make this experience possible, four to be exact. Between the preschools who cancelled meetings and those who refused to consider adding Joey to their community, the world of isolation and discrimination became all too real. Just look at Joey, who wouldn’t want to bring his smile into their lives? Finally, when It’s All About Kids Preschool wanted to include Joey, Summit DD’s Community Partnership for Inclusion (CPI) program was there to offer training, supports, and equipment to set him and his classmates up for success. Joey and his classmates are thriving and learning a great deal from each other. “From the staff at It’s All About Kidsto the team at Help Me Grow and Summit DD – we are seeing our dreams of Joey learning independence and having friends and adventures become a reality. It is one of the most overwhelmingly amazing and incredible feelings,” said Jen, Joey’s mom. Summit DD’s Community Partnership for Inclusion (CPI) program has had a far-reaching effect on the communities in Summit County by offering supports to private day care centers to encourage integrates child care options. Through partnerships with 16 child care centers in Summit County, 37 children are now being offered quality, inclusive child care in the communities in which they live, 198 child care staff get to care for and nurture a diversity of kids, and 1,024 children get to experience friendship with their peers, regardless of disability. Summit DD inclusion specialist, Jennifer, met with Joey’s preschool staff, supplied seats and tools, and made adaptations in the classroom, ensuring that the biggest transition to preschool would be saying goodbye to mom on the first day instead of encountering obstacles in the classroom. Jennifer met Joey on his first day of preschool and stayed the entire morning, making adjustments for him as needed in the classroom and texting photos to mom and dad to let them know their little guy was spreading his wings. Since that first day, Joey has done just fine making his own friends. His very best friend, brother Tommy, is in the classroom next door. Tommy is always there to make sure Joey is ok. Through CPI, he has access to a gait trainer that allows him to stand at the same level as his friends. One day Joey will walk on his own and when he does, his friends and brother will be there to run and play by his side. One out of every three residents of Summit County does not believe that children with special needs should be included in classrooms with their typically developing peers. Joey’s classmates and more than a thousand others touched by CPI will tell you differently. Kids are kids, and when left to spread their wings they will tell you they don’t see disability, they see a friend.